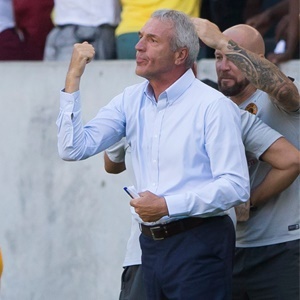 Cape Town - Kaizer Chiefs coach Ernst Middendorp believes the club's strong online following helped motivate the team ahead of Saturday's 1-1 draw with Black Leopards. Chiefs went into the Premiership clash with Lidoda Duvha having lost their previous encounter to Baroka. The result seemingly did not go down well with supporters who expressed their disappointment on Chiefs' various social media platforms. As such, Middendorp has revealed the large following of the team helps to remind his players of their responsibility about producing performances. He said: "The result, I think we all saw the game, was definitely not satisfying. By half-time we already had a number of possibilities where we should have made better decisions. "In the second-half, the final activities in the final third, definitely we know we can do better, and the result is definitely something we're not happy with. "But regarding the performance, after the last game, we have over 3-million followers on social media, so we can't present ourselves the way we did against Baroka. "Comparing that to this game, I saw a different attitude and mood since [Friday], when we arrived, and even when we warmed up, you could see what was coming. "In the end, I feel a bit sorry that we didn't really capitalise on our activities and actions at the end of the day to take home the three points." Chiefs are next in action on Saturday when they meet Chippa United in a Nedbank Cup semi-final. The action gets underway from 20:15 at the Nelson Mandela Bay Stadium in Port Elizabeth.